HOLD UP! You want to see this at the Argentina Film Fest. This weekend is all about taking a breather before the cranberry sauce countdown begins and the wild rumpus of relatives starts. And if the rumpus has erupted, think of the following events as the perfect alt-intro to L.A.
No tourist cooties for you. Guaranteed. Solution: A Hollywood premiere and party. Give Sissy her dose of Hollywood with the Friday night opener of the 12th annual Argentina New Cinema, co-presented by the Consulate General and Promotion Center of the Argentine Republic in Los Angeles. Get to the theater early so your sib can snap selfies with the star-studded sidewalk while you avoid embarrassment at the other end of the courtyard. Then, head into the classic Egyptian Theater for the Los Angeles premiere of To Fool A Thief, one of the weekend fest’s two heist comedies and four Los Angeles premieres, including The German Doctor: Argentina’s official 2014 Oscar submission. After the screening, all ticket holders are invited to a reception featuring empanadas and wines provided by sponsor Wines of Argentina. Sis will be amazed to see that stars eat empanadas just like everyone else does. Solution: An all day food, music, and architecture happening. Pop doesn’t want to spend a lot of money. Mom wants to shop for “exotic” ingredients. Grandma wants to get off her feet with a cup of coffee. Your teen bro wants to pretend he doesn’t know any of you. 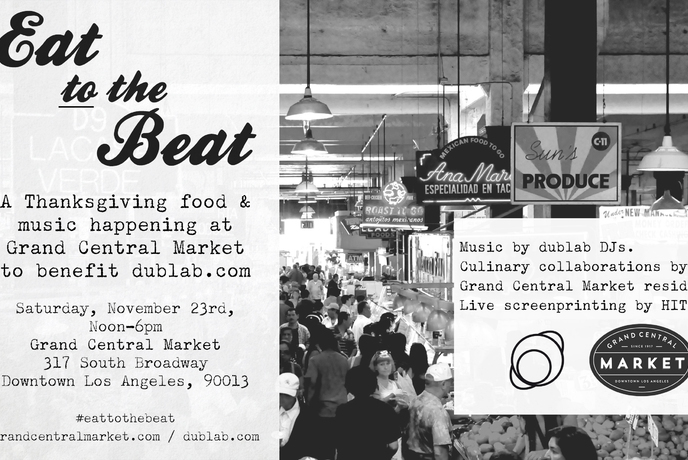 Make everybody happy, including you, with the all-day Eat to the Beat pre-Thanksgiving bash at Grand Central Market: Broadway’s almost-a-century-old market/food court. Plus, Grandma will go ga ga over G&B Coffee‘s “interpretation” of Starbuck’s holiday menu. dublab curates the event, which features a vinyl sale, Little Junebugs kids activities, and screen printing from Hit+Run. dublab DJ’s will be dropping beats all day so be prepared to dance ’til you drop. Just don’t get Eggslut on your little brother. 100+ Artists,the Out-of-Towners, and You. 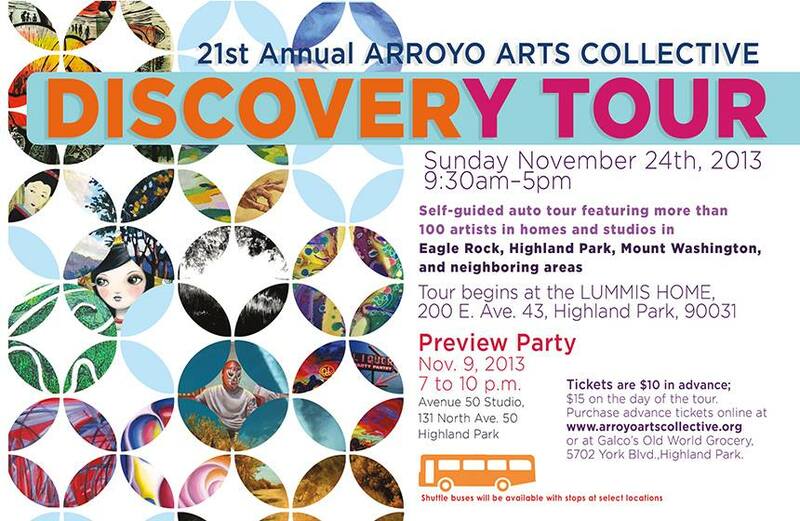 When visitors say they want to see the “real Los Angeles”, the Annual Arroyo Arts Collective Discovery Tour is how you respond. “NELA” (North East Los Angeles) neighborhoods such as Highland Park, Eagle Rock, and Mt. Washington. L.A.’s early boho artist culture first started in NELA and flourished with the help of local booster/Los Angeles Times editor Charles Lummis who threw wild parties for artists and other creative types in the river stone house and native gardens he built by hand. You’ll sense the ghosts of parties past when you visit Lummis’s home “El Alisal” to pick up your tour badge and map for a day of hobnobbing with artists, adding to (or starting) your art collection, and cleverly buying unique holiday gifts way before Black Friday. Also, keeping your guests in a constant state of impressed astonishment…. Ms. Go Go’s must-sees include seminal installation artist Michael Arata, painters Jose L. de Juan and Gwen Freeman, multi-disciplinary artist Frances Garretson, fiber artist Connie Rohman, artist blacksmith Heather McLarty, visual artist/writer J. Michael Walker, Amy Inouye’s Future Studio and the astonishing gallery of Clare Graham. Then bask in the glory of your status as World’s Most Creative Host.